So it is with that passion for collecting interesting natural items that I invite you to participate in The Fabulous Rainy Day Riot Autumn Nature Exchange! What is it? It’s a fun, pen pal-like exchange where you fill an egg carton with natural items from your local area, and mail them to someone far away, and then you get a carton of stuff from where they live in return! I first heard of this idea on the lovely and sadly defunct blog Rhythm of the Home. We participated in a nature exchange a couple of years ago, and we received so many cool things from a friend in northern California. Oak galls! Weird skinny California-style acorns! Palm tree seeds! My kids were so excited they seized everything out of the carton and ran off with it before I could even finish matching all the items with their identifying labels. Some were dissected and investigated, others preserved with care. The surviving items served as everything from fodder for our science table to a Thanksgiving centerpiece to characters in an elaborate storytelling game. Picking up interesting ephemera to save for later is a universal impulse of childhood. Just the act of collecting itself is immensely pleasurable, both for children and adults. I often have to curb my children’s desire to bring home things from a state park or nature preserve to show Papa. And whenever we take walks around our neighborhood (or often even our own yard! ), we come home with all pockets full. 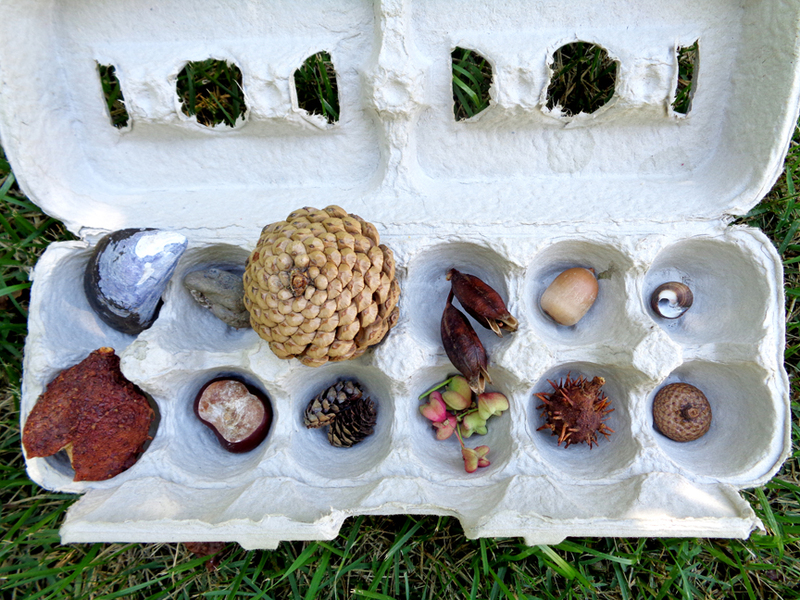 The Rhythm of the Home blog post I mentioned above has some excellent tips for doing a nature exchange, such as the idea to wrap delicate items in tissue paper, don’t collect from protected areas, and be careful not to include any invasive species in your collection. I’d like to add a tip of my own for collecting: double down. Collect two of everything. Since it’s best to gather only things which are abundant in the environment, it’s usually not too hard to find another of each neat item you choose for your collection. Finding a second one of each treasure can also add a fun element of challenge to the endeavor. Best of all, you get to keep a set of all the neat things you found. It’s an especially good idea if your kids tend to get particularly attached to their finds, as mine do. 1. Each collection should contain about a dozen items. An egg carton is a good reminder of the size/quantity the collection should be, as well as good packaging for protecting it on its postal journey. 2. Gather your collection from unrestricted locations (i.e. not state parks, nature preserves, or other protected areas). 3. Be careful not to send any invasive species, and please keep your exploration of the stuff you receive indoors, just in case. If you’re sending something that might harbor bugs or larvae, such as acorns or pinecones, you can prevent hitch-hikers by treating your items to a couple of hours in a 175-degree oven, as described in this post. 4. Collections should be mailed to your exchange-pal by October 31, 2014. 5. If you’re so inclined, please share photos of your collection, or the one you receive, to the nature exchange flickr group: The Rainy Day Riot Nature Exchange.